Idyllic days, peaceful nights, and all the best of Southern Louisiana await at this serene riverside home. Exposed beam ceilings, comfortable furnishings, and floor-to-ceiling windows invite you to relax and rejuvenate beside the Tchefuncte River. Sink into the comfy chairs in the living room, and curl up with your favorite book in the sunlight streaming in through the wall of windows. Turn on the flat-screen cable TV and catch a game or watch a movie as you unwind. Just through the sliding glass doors, the expansive second-story deck is furnished with padded seating so you can enjoy stunning views. From here, you can head down to the docks to swim or spend a day out on the water in your boat. When you return, stay in the shade on the covered patio below the house, where Adirondack chairs and 2 charcoal grills provide the ideal barbecue space for your group. The chef won't want to miss cooking in the fully equipped kitchen, which boasts stainless steel appliances and ample counter space under cathedral ceilings. The extended hardwood dining table has plenty of space for everyone in your group to enjoy home-cooked meals together. 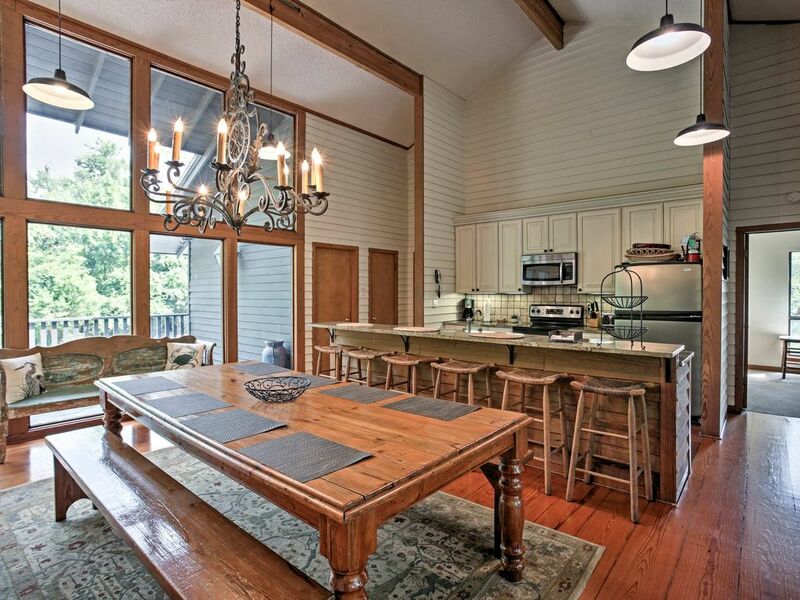 If you need additional seating, the breakfast bar boasts 6 stools. Go for an evening ride along Tammany Trace and experience the lush tree-lined path before returning home. When you're ready for bed, retreat to any one of the bedrooms where you can climb into your king bed and watch one last episode on the flat-screen TV before dozing off for the night. Bring your boat along and park it at the private dock for endless fun spent on the Tchefuncte River! When you need a little more room for watersports, follow the river to Lake Pontchartrain. Travel 14 miles to Fontainebleau State Park, a 2,800-acre park featuring the ruins of a sugar mill built in 1829, a sandy beach, countless trails, and over 400 different species of animals. Those looking for an extensive hiking and biking trail will want to hop on the Tammany Trace Trail, a converted rail trail that spans 31 miles. The exciting culture of The French Quarter is just over 40 miles away from the home. There's something for everyone to enjoy including boutique shops, museums, restaurants, and plenty of nightlife. Take advantage of the many festivals that happen each year here including Mardi Gras and the New Orleans Jazz & Heritage Festival. This was such a great location for 7 ladies to have a retreat ... spacious kitchen, cozy living room with fireplace just in time for the cold snap that hit. The split floorplan was very nice too. LOVED the porch overlooking the river. Somewhat rustic but warm and inviting. This was a long weekend get away with family, The house was perfect for us to be able to relax and enjoy each other’s company in a very quite area just minutes from the City of Covington and all of its great restaurants, although we chose to prepare our own meals!! I just can’t say enough about how this house is set on the property and let’s the natural setting of the river keep its identity. Fantastic home! Wonderful scenery. So peaceful. The owner is a pleasure. Was really nice, great time. Nine high school girlfriends got together for our 70th Birthday Celebration and this home was perfect! Beautiful views of the river. Best private location with plenty of parking and close to Covington shopping and restaurants! Would recommend to families and friends! Thanks again to the owner for his gracious service!